Do you have a digital marketing plan in place for your company’s website or e-commerce shop? If so, you are probably familiar with helpful services, like Google Analytics. You’ve probably used Google to measure things like your page ranking, indexing and crawling, and user experience. But how much time and resources have you honestly spent on optimizing your website for other search engines, such as Bing? Too many of our clients report that they never thought about marketing for Bing or optimizing their site to rank higher on Bing’s SERPs. Many business owners assume if they rank well on Google, they likely rank well on Bing, also. Unfortunately, however, this is not entirely true. Bing uses different ranking factors to measure your site and determine a place on its results pages. For example, this peer-analysis done for SEOmoz shows Bing values shorter URLs in comparison to Google. Additionally, they also favor site homepages more than other pages, as compared to Google. Before we get into a list of differences between Bing and Google, however, lets address why Bing ranking is essential in the first place. Back in 2014, Firefox made a subtle but significant change: they switched their default search engine from Google to Yahoo. At that point, Bing had been powering Yahoo searches for five years, following an agreement with Microsoft and Yahoo in 2009. Thanks to that change, Yahoo usage jumped almost 20% overnight. Today, search engine usages ranks at about 63% of audiences using Google and around 35% using Bing and Yahoo. As such, it stands as Google’s primary competitor and a viable option for anyone who opts to avoid the more traditional Google search engine. But what does that mean for your company, your website, and your SEO tactics? Simply put, it means you should be making an effort to ensure your site Bing SEO optimized. 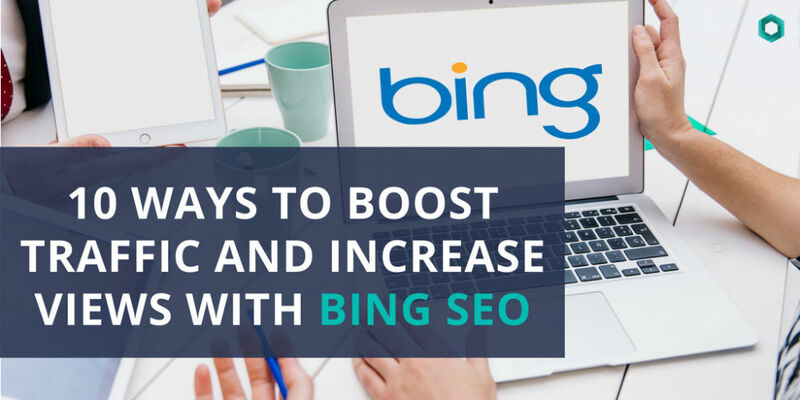 Through a measure that is known as “pogo-sticking,” Bing determines the level of user engagement your site generates. It does this by measuring how often a user searches for something, clicks on your site, and then returns to the search results – aka pogo-sticking. Bing concludes that users who are returning to the search results a short time after clicking your link are not engaging, thus leading to a lower User Engagement score. The goal is to ensure that your site offers the answers these users are looking for, to ensure they stay on your page once they find it. Sort of the user engagement measurement, the click-through-rates determines how many people are realistically clicking on your links – which is the ultimate goal. Even if you are the very first result, you won’t see any conversions without click-throughs. Subsequently, if your click-through rate is lacking, Bing will rank your page accordingly. Bing is pretty clear about their stance on social signals. In their Webmaster Guidelines, they mention that positive social influence – such as lots of followings sharing your posts and information – can impact how your website ranks organically. Google, on the other hand, says they don’t measure social signals in regards to page ranking. However, a study done by CognitiveSEO seems to support the notion that a strong social presence can lead to better rankings. When it comes to keywords, Google and Bing operate quite differently. Here’s where your SEO approach will vary if you are hoping to rank well on both SERPs. Simply speaking, Bing’s way of processing language is less sophisticated than Google’s. Where Google understands synonyms and more “human” language, Bing favors appropriately placed, straightforward keywords. Be careful here! Keyword stuffing won’t bode well with either, and even using keywords more than three times per page can run the risk of flagging negatively with Google filters. Another big difference between the two search engines is the way the address backlinks. Overall, Bing doesn’t favor them as much as Google does. Moreover, they value authoritative links (.edu, .gov, .org, etc.) much more than typically websites. Backlinks in footers, sidebars, or lists won’t help you, either, as Bing doesn’t recognize these when measuring. Anchor text is another area where you need to be smart with your SEO tactics to ensure that you satisfy both Bing and Google. This is an important factor as far as Bing Ranking goes. But remember, Google does well with keyword matching, meaning it can read synonyms and context. To rank well, use anchor text that matches the keywords you are aiming for, without overstuffing. You don’t want to trigger the Google Penguin filter, either! Google announced HTTPS as a ranking factor in 2014, albeit a minor one initially. Bing, however, does not factor SSL certificates into their page ranking system. As mentioned, Bing places a high emphasis on the user experience. To measure this, Bing will crawl your website and determine the “user friendliness” of your site. It factors in the structure of your site, which you have organized in a way that allows visitors to access information quickly. Onsite optimization for Bing works very similarly to Google, and it favors well written, keyword-oriented meta descriptions and title tags. Bing specifies that web pages should stick to one H1 per page, using H2 and H3 tags to break up content with sub-headers. It is no secret that Bing favors site authority when determining ranking factors for sites. Aged domains, or a long-standing web URL, will give you a leg up on the competition. This is particularly true if your URL includes a keyword, another factor that Bing considers when ranking. If you’re working with a brand new domain, you can still take steps to boost your page rank on Bing’s SERPs, but it won’t see your website with the same authority as older sites. As we mentioned above, Bing also notices when websites incorporate a strong, relevant keyword into their URL or domain name. You have to be careful, though, because creating a new URL just for this purpose will leave you at a disadvantage, considering the importance of page authority for Bing. Plus, Google may penalize you for these domain names, so try to find a working keyword that isn’t an exact match to the ones in throughout your site. Thankfully, Bing SEO is much less in-depth and complicated than Google SEO practices. Many companies find that they can implement some changes themselves, but you can always turn to a full-service company, like Clicc Media Inc, to help you maximize your online presence. Contact us today at (954) 271-3111 for a one-on-one consultation to best understand where your SEO presence can be optimized. Hey, thanks so much for the mention. Bing SEO is not to be sniffed at! Great article. It was a great article, thank you for putting great information out there.